In continuation of my previous post about my days spent in Barcelona. 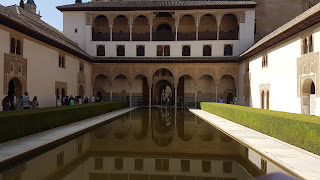 This is the next part of my vacation and in this article, I will tell you, Seville and Granada. I'm sure when you read Seville, ZNMD (Zindagi Na Milegi Dobara) might come as it was one of the places they had covered did skydiving there. Granada another small town about 3 hours away from Seville and you should go here for 2 main things i.e. the Alhambra and the Generalife about which I will talk later as we go down. To begin with Seville, I was here for 2 nights and only 1 days to explore, but it was the whole day as the next morning I had a bus to Granada. (remember to book your bus/train tickets beforehand). 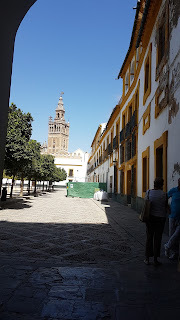 In Seville, stayed at Hostal Puerta Carmona and the reservation was done at Booking.com. 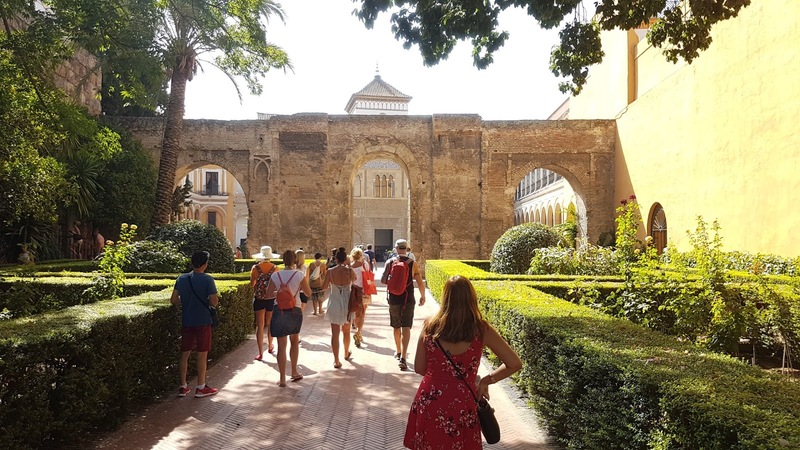 Day 1 began with a tour of the Alcazar of Seville, Old Jewish Quarter, The Seville Cathedral and the Giralda Tower and the tour was organized by Andalsur Excursiones. 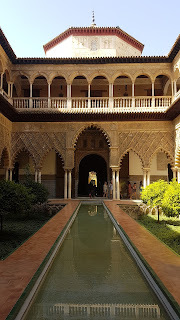 The tour lasted about 3 hours and started with exploring the Alcazar of Seville. This is the place where season 5 of Game of Thrones was shot, remember The Water Garden of Drone, that's right. 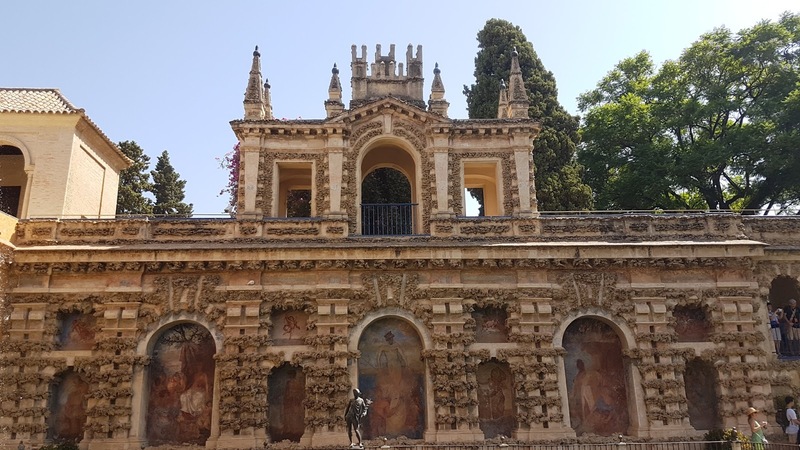 This is one of the most beautiful places I had seen in the entire Spain (a heads up, more beautiful things are about to come.) 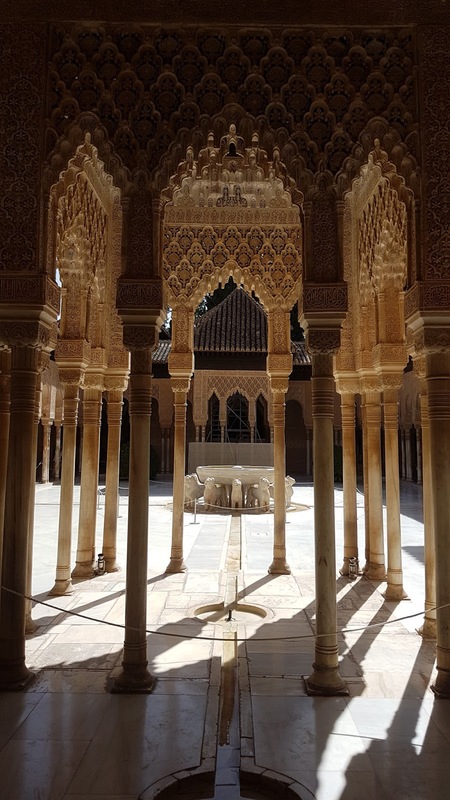 The architect and the way the place is made will keep you stunned with the detailing the Muslims had done when they invaded the Spain. Now also when I just browse through my gallery and come across images from here, they just remind me how beautiful the place is and how much dedication and attention went into building the place. If you have some biscuits or crackers in the bag and come across the pond, try feeding the fishes and you will see that they will kind of go mad for the food and jump and top of each other. Next, in line comes the Old Jewish Quarters, small lanes, small houses and a good place to spend some time here after the Alcazar. There are some places to eat if you are hungry. 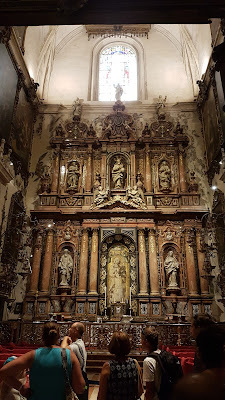 The tour ended at The Seville Cathedral. Trust me, this is one of the best cathedrals I have seen while traveling across Spain and the cities. I would put it in the top 3. The place is huge and has many stories inside. If you have some energy left and are in the mood for some adventure, climb up The Giralda Tower for a breathtaking view. With this part 1 of the day was over and yes, there is part 2 also, the second half of the day. 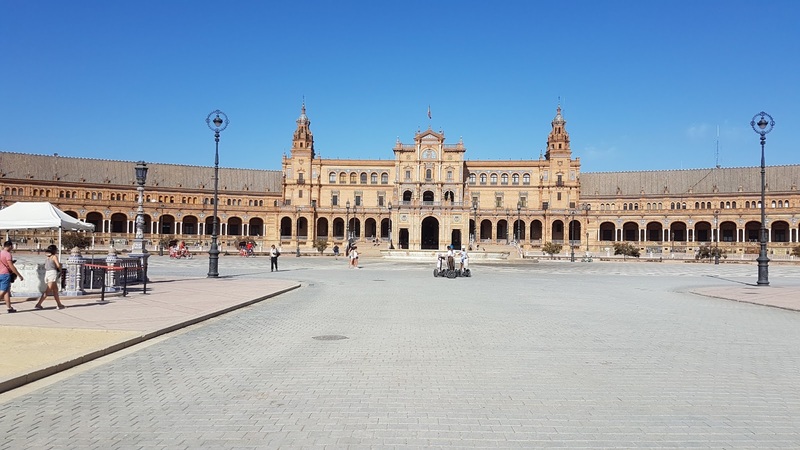 The evening slot I had kept for some other places to explore like Plaza de Espana, take a walk in Parque de Maria Luisa, experience the Flamenco which is a must if you are in Spain. One needs to book themselves for a show of Flamenco. 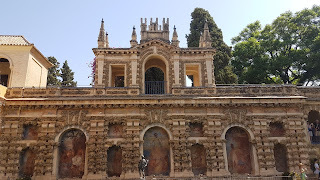 You can easily spend a couple of hours in and around Parque de Maria Luisa. Check out Plaza de Espana which is a government office now but has small benches which are covered in tiles that represent the 48 provinces of Spain. Near the Old Jewish Quarters there are many places that will give you the entertainment dose that you need, i.e. the Flamenco show. It usually lasts for about an hour. Once the show is over, you can grab some food in the restaurants nearby along with a drink. The Patata Bravas here are pretty good to try here. One more thing that is a little different and I'm sure you won't find anywhere else i.e. the kissing lane. It doesn't mean that people come in this lane to kiss (that can be done), the name of the lane was giving because, it is the narrowest lane here and when two people look out of their windows, you can actually kiss. That is all I could cover in Seville due to some time crunches but in case you have the time, there are some other places also like the Bull-Ring, the Metropol Parasol, the Puente de Isabel II bridge and it is said that the view from here overlooking the waters and the city is amazing. After coming back and looking at some of the images I wish I had gone here to click photos mainly :P and also to enjoy the view (I love water bodies like lakes and rivers). A small tip, if you are into cycling, then you can rent a cycle and roam around the city on it, the rent is as cheap as 1 euro for an hour. 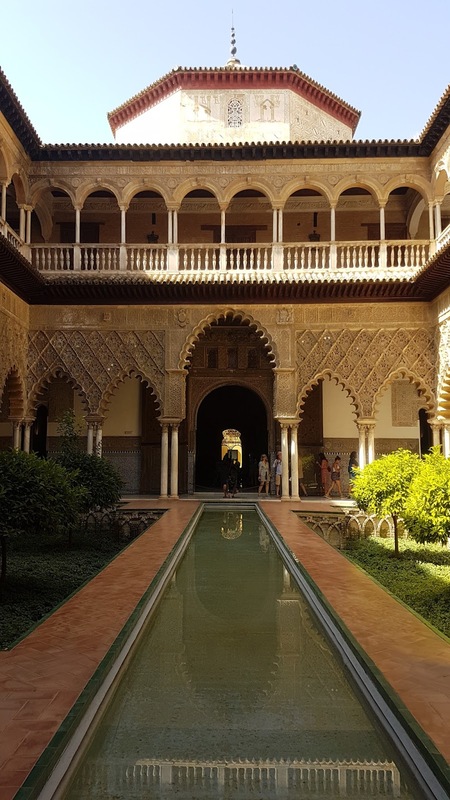 It was time to say goodbye to Seville and move to the next city on my list and it was Granada. Another not so small town which was quite beautiful I must say. Let's start with the next day and about my time spent in Granada. I reached here a bit late in the evening as I had made my bus bookings but later I realized that I should have taken a bus that travels in the night so that I would get the 1st half to the day to enjoy but never the less lesson learned and a point to be noted. Technically I had only an evening and a full day in Granda to explore as much as I could. Stayed at Hotel Inglaterra (The rooms, services are pretty good and it's not very expensive, to be honest) which was quite centrally located. 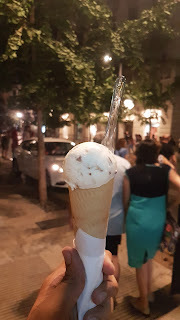 It was only a couple of minutes walk from the Granada Cathedral, the happening area where all the bars, restaurants are was only about 4 mins walk from here, in fact, as soon as you get out of the hotel, there are some bars where you can grab a drink. Remember that with every drink you have in Granada, you get a free tapas, its a tradition there. You can walk around the place and explore the eating joints, the places where you can drink and if you are in the mood and not tired, go for a bar crawl across different bars, drink and eat and enjoy it, trust me you will enjoy it. There was one place serving ice cream which I came across while walking back to the hotel post dinner. Heladería Los Italianos is quite easy to spot as you might see quite some people there and the ice cream here is just amazing. I actually went the next day again to get some more for myself. Also, I had grabbed a bite to eat at this kebab place which served huge portions. You either order the rolls or the doner kebabs, they were huge and quite filling. There was another ice cream place just opposite the kebab place and their dark chocolate ice cream I can say was the best I have ever had. 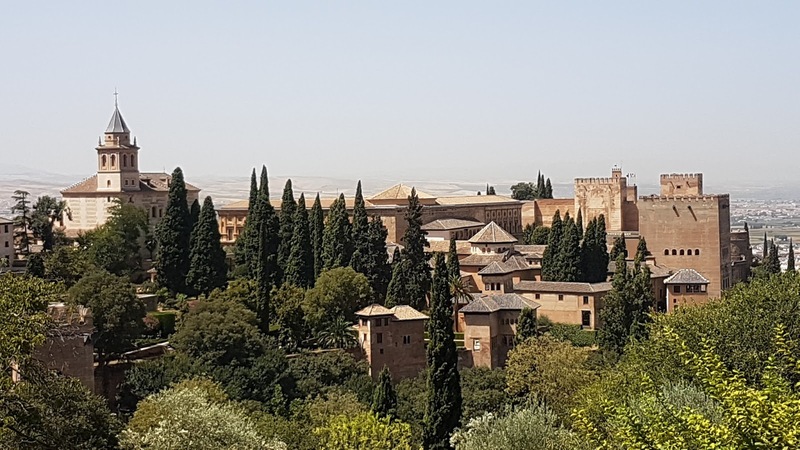 The next morning started with visiting the most important thing and one of the main reasons for which Granada is known that is the Alhambra. Always remember to book your tickets for this in advance as they only sell close to 7000 tickets per day. 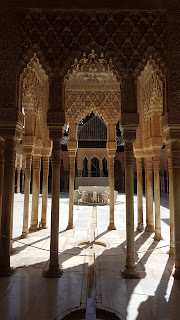 This I can say is the 3rd most beautiful place I had seen in Spain after La Sagrada Familia and The Alcazar of Seville. Remember that when you visit the place, you need to also select the timing for your visit to the royal palace as they allow only a limited number of people during a particular hour or duration. Do not miss the detailing which is done on all the walls, the ceilings, and the facades. It is said that the higher the ceiling, the more detailed and beautiful the work is and I will personally agree with it as well. If you are a fan of antiques and old artifacts then make sure you visit the carpenter workshop, it's a small room where they till date make the furniture which was originally designed by the Muslims to be used in the Palace. Some of the artifacts that you can purchase are jewelry boxes, cheese boards which are all handcrafted keeping the original designs. They are quite a collection for all the collectors. 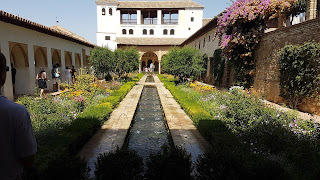 Once you are done with Alhambra, visit The Generalife to check the beautiful plans, greenery and more. The place was originally used as a place to grow the vegetation for the people living in La Alhambra. To be honest, if I had the time, I would have stayed here for a couple of hours and relaxed. After taking the tour of Alhambra and The Generalife, on the way down (this is a hidden way between the trees and the streets which will directly take you to the city center within a short time, use Google Maps or you can also ask someone to give the directions) you will come across a lot of places to eat where you can grab a bite if you are hungry. There are also some studios who do Flamenco and you can book yourself a seat if you haven't seen it yet. There is a lot more that I can tell about Granada as to what are the other places you can go like The Albaicin, The Granada Cathedral, There are some streets near the city center where you can shop for clothes, souvenirs and more. If you are along with some friends than do a Bar Hop for sure and you can actually do it with a long list of places to visit as there are quite a lot of them located close to each other. 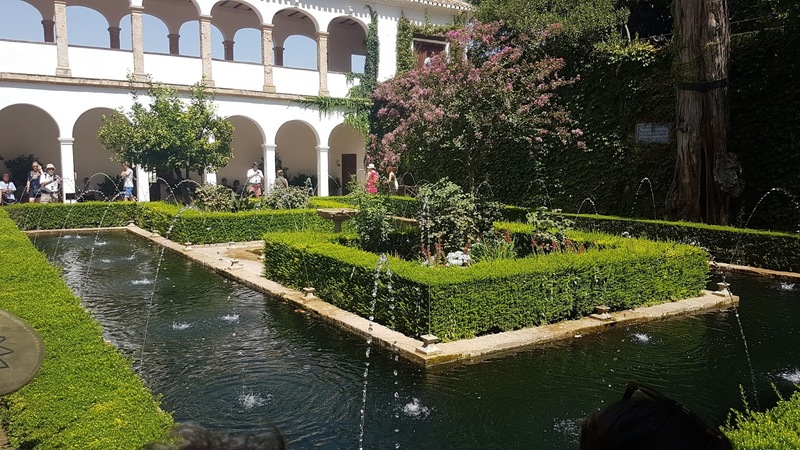 Post my travel to Seville and Granada, I headed off to Madrid, the capital of Spain to explore the food, the places and the nightlife there. So if you want to read about that as well, subscribe to the blog and you will get to see how it was. I will also write down some other places you can visit in Madrid along with my experience.